A bullock next to the unfenced road between Ashkirk and RobertoN. Curtis Welsh caught the interest of a bullock next to the unfenced road between Ashkirk and Roberton while he was taking this image. David Millar seems to be in a flap about flags that were flown by Lauder Community Council (letters, June 28). I and many others welcomed the flying of the rainbow flags at Lauder Town Hall, as a display of support for the LGBT (Lesbian, Gay, Bisexual and Transgender) communities, and a demonstration that the community council is an inclusive organisation. If the display helps young people develop, increases acceptance in society, or increases participation in local democracy, then it will have been a success. Mr Millar claims to “fully back the idea of supporting the LGBT community”, but describes the flag-flying as “nonsense”. Instead of his “piffle and pontificating”, he should suggest ideas to help LGBT people. English is the official or primary language in more than 50 countries from Singapore to Scotland. It is the international language of business, law and culture. It is so unique that its phrases are adopted into foreign speech. Isn’t it remarkable then that with English the official and primary language of Scotland, it is being diminished by treating it as similar to Gaelic by the SNP executive in official branding? Gaelic is a technology-free language spoken by 1% of the population and written by even fewer. Clearly the SNP wants to make Scotland as different as possible from England, and making Gaelic officially equivalent to English is one way to do that. Nowhere is this more inane than the branding of police vehicles with the words ‘Poileas Alba’. Police Scotland’s five-year Gaelic language plan runs until 2021, during which time all signage, logos and stationery will be duplicated in Gaelic. How will this help Police Scotland keep the country – from Wick to Annan – safe? This is yet another victory for yet another minority, paid for by the silent majority whose taxes fund all the inclusivity, diversity and gobbledegook the SNP bosses can come up with. Yet there are many in the SNP who oppose policies like the Poileas Alba nonsense, but what do we hear from them? Nothing. Are they so afraid to speak their minds that, like wee, cow’rin, tim’rous beasties, they toe the party line like North Koreans? Are they afraid of being summoned to SNP headquarters in Edinburgh accused of “bringing the party into disrepute”? Isn’t it time for honest voices within the SNP to make themselves heard? Gina Miller, Patrick Stewart and others calling for a “people’s vote” on the final Brexit deal assume that the EU will offer one: I am not so sure. In Britain’s 40-plus years of membership, she has never been able to deflect the idealogues from their aim of a United States of Europe. Never has Britain managed to extract any change along the lines that any British government sought. The EU has never had any intention of reforming. In an attempt to keep us in the EU, David Cameron went to Brussels to negotiate “reform”: he came back with less than nothing. How can anyone who has listened to Guy Verhofstadt, Donald Tusk, Jean-Claude Juncker and Michel Barnier during the EU referendum campaign and subsequently believe that a sensible deal can possibly be negotiated? Even after Theresa May’s constant stream of concessions, no reasonable deal is likely. The British government should now inform Brussels that from March next year Britain will leave the EU and trade with the bloc on World Trade Organisation rules. Once we and our money have left, the thus-far ignored citizens of the 27 member states will demand the removal of Barnier and his replacement with a genuine negotiator and perhaps a deal can be done. Whether a deal is actually necessary is debatable, but most people seem to want one, in which case let us leave and let the EU come to us. Once it seemed Brexit could simply mean Brexit. Yet, with passions running ever higher, it became clear that Brexit could mean no-deal for some, or no-Brexit for others. Now, after so much rancour and discord, we might at last settle on Brexit being a reasonable compromise that, hopefully, makes sense for the EU, as much as the UK. Except in Scotland, of course, where the SNP tells us that whatever Brexit might prove to be, above all else it must be an excuse for another independence referendum. The UK has gone to war to protect the democracy of A. N. Others and remove despots from power – for example, Saddam Hussein in Iraq and Muammar Gaddafi in Libya. Prime Minister Theresa May recently betrayed the 18 million people who voted in the 2016 referendum to leave the EU. This is a revolution in reverse. This is a constitutional outrage. May has ignored the result of the biggest single vote in the history of this country and allowed the vested interest of big business, civil service, political class and arrogant Remainers to ignore and bury the Brexit democratic vote. Theresa May’s behaviour is that of a despot, therefore she must be removed from office. We require a leader who is not a defeatist who goes begging for crumbs at Jean-Claude Junker’s table. We have had two years of ministers fighting among themselves instead of fighting Brussels. It is becoming very clear that those who are supposed to represent the people care only for their own political selves. The referendum has been sabotaged. The government has behaved in a reckless and incompetent way throughout the entire Brexit talks and that is another reason why May must be removed from office. We need someone like Nigel Farage to head the team to secure Brexit. So, the EU Remain camp want another referendum – this time with three options. The Remain option stays as one, but the Leave choice becomes two different options. Result: 48% still votes Remain, the 52% Leave vote is split in two. Remain wins. Brilliant! We have been here on holiday from Melbourne, Australia, tracing my husband’s family in Kelso. 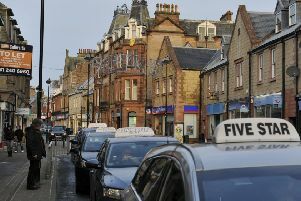 His great, great grandfather – William Reid – owned a baker/confectionery business at 38-39 The Square, Kelso, from just after 1875 and it was taken over by his wife, Mary, and later daughter Magdalene upon their subsequent deaths. We have visited his grave in the town’s Rosewood Cemetery on two past trips to find that flowers have been placed there during our stay. We are hoping that my husband has long-lost relatives still living in the area and would love to get in touch. Local authorities are unable to assist with names/contacts and we were hoping that one of your readers may be able to help solve this mystery and reunite family members. This would mean so much to him. I have been brought up to believe that the right to vote is very important. People fought and died for this right and we are lucky to live in a democratic society whereby we have the opportunity to decide who governs this nation. So, with that in mind, I have always voted in local and national elections, and the past two referendums, with pride. I remember when I first voted, aged 18. I was not at all politically astute or savvy back then – but one thing I knew I would never do and that was to place my cross next to the Conservative party candidate. I was brought up knowing that I should never vote Conservative. I was told by family and friends when I was a young man that the Tories are there to represent the interests of the wealthy, big business and the landed aristocracy who ultimately rule the nation and keep the poor poor. The Tories certainly do not represent a working class lad like yours truly. Many years and elections have been and gone since I was 18. Nowadays, being somewhat wiser and older, I am much more politically engaged and I have seen for myself first-hand why I have not and never will vote Tory. I have seen how the Tories take no interest in the poorest, the needy or the most vulnerable in our society. If anything they have been demonising and attacking them through the introduction of parliamemtary legislation and laws under the guise that “we are all in this together”, to use the phraseology of David Cameron (ex-Prime Minister and Eton/Oxbridge educated). z Cut inheritence tax for the wealthy. And let us not forget the explosion over the past few years of people having to go to food banks to feed themselves up and down the United Kingdom – not exactly a party for the whole nation. I now find myself saying to young voters, “Never vote Tory”. Funny how sometimes things stay the same. Drug deaths in Scotland are appallingly common. Being an echo chamber of “progressive” liberalism, the Scottish Parliament cannot muster anything in response beyond decriminalisation, tackling dealers and support for addicts. Utterly absent is the principle that illegal drug abuse is irresponsible and selfish. The amoral “harm reduction” approach focuses on relieving the human misery currently manifest, but at the expense of maintaining the cycles that produce it. It’s time to regain the understanding of the wider consequences of drug abuse. It’s not just a matter of personal risk assessment; abusers endanger the wider public, cause pain to their families and massive cost to their unfortunate employers or, more likely, the state. Not another penny of taxpayers’ cash should fund organisations peddling “we’re here to help you take drugs safely” messages – especially in schools. Persuade people that the dangers of drugs can be managed and the deterrent against experimentation is diluted. Our society has decreed, with good reason, that it is unwilling to foot the bill of pain, injury, distress and health care generated by personal decisions to take drugs – so they are illegal. However, being of a compassionate bent, we do actually foot the financial bill when it comes to it, but there is every justification to use the full power of the law to deter people from destroying their own lives and blighting society through such chronically-selfish irresponsibility. Society should protect young people by fiercely attacking supply chains, deterring personal possession, communicating the dangers, making it clear that illegal drugs are not an acceptable choice in Scotland and, above all, insisting that it is wrong to endanger others while expecting them to foot the bill for one’s self-centred pursuit of fleeting sensation. This year’s Christian Aid Week raised £3111.38 in Galashiels and Clovenfords. Through your letters columns, I would like to thank the people for their generous response to the annual appeal, thus supporting Christian Aid’s mission to relieve the misery, hardship and deprivation caused by war, conflict and disaster worldwide. Re ‘Choice of options for Eildon practice’, Southern, June 28. Option 4 (of the options being offered to patients of the Eildon medical practice) proposes a new building for all patients in “Melrose and Newtown”. Councillor Elaine Thornton-Nicol is concerned that there is a need for the practice to remain “sited within Newtown”. Are NHS Borders, your reporter and the councillor unaware that the practice also includes St Boswells which lost its surgery several years ago? Last month the Citizens’ Advice network supported Scams Awareness Month throughout Scotland. It is very important that we all continue to be aware of the continuing threat from what are becoming increasing-sophisticated scams. Scams can affect us all, but are particularly dangerous for some vulnerable groups. We can all encourage friends and relatives to be careful, not to divulge sensitive financial data and always check with a bank, supplier or whoever before making any financial commitment. A relatively high proportion of older residents in the Borders provides a potential target area for scammers. Recent bank closures can make it harder to check in with the local branch and is likely to lead to even more reliance on telephone and online banking, shopping etc., with the associated potential dangers. Scams are criminal, nasty and prey on vulnerable people. There are two simple questions we can all ask when something doesn’t sound or look quite right. Firstly, if it sounds too good to be true, it probably is. Secondly, ask yourself, why am I being asked for this information? I would encourage everyone to report any suspected scams to the police and trading standards. VANDALISM – A LONDON CALLING? Can any of your readers tell me the thinking behind Rule 5 at Kelso skatepark which states: No graffiti or vandalism please, “this isn’t London”. Are we to understand that all Londoners are vandals, or even that it is OK to go to London to practise our graffiti skills? Scotland’s local authorities claim there is no money as they cut essential services. Year-after-year, council tax payers get poorer value for their money while the overpaid executives and councillors receive salaries that they would never get in the private sector. Official Scottish Government figures reveal that the country’s 32 local authorities failed to collect council tax of £93.2m for 2017/2018 and £77.6m from 2016/2017. In total, £1.3bn remains uncollected. The 32 chief executives and 1,223 councillors must be held accountable. Where someone does not have sufficient income, then they do not pay any council tax, only water rates collected on behalf of Scottish Water. So those who owe council tax can be classed as “can pay, but won’t pay”. These households are wilfully avoiding paying, so legal action should be taken, including forfeiture of television sets. That would produce a quick result. As the nation looked to the skies earlier to see the RAF’s most historic and newest aircraft fly over Buckingham Palace, it was a moment to pause and reflect on the sacrifices made by all RAF personnel during 100 years of service. The flypast also marked the midway point for the RAF100 Appeal, a major fundraising drive launched by the RAF and its four main charities. People like Battle of Britain veteran Stan Hartill who serviced the Spitfires night after night during the Second World War, who lives in comfort and dignity thanks to the RAF Benevolent Fund, one of the Appeal charities; or Mike Goody, injured while on patrol with the RAF Regiment in Afghanistan, whose home adaptations have given him back his independence. To find out more or get involved visit: www.raf100appeal.org. As a keen walker I’m delighted to be supporting Bowel Cancer UK and Beating Bowel Cancer’s Walk Together to save lives and improve the quality of life for all those affected by the disease. My mum was diagnosed with bowel cancer and is thankfully now recovered, so I know how important it is to raise awareness. Walk Together is a perfect opportunity to bring people together from all “walks” of life, to show our support for those undergoing treatment, remember loved ones and help stop people dying from bowel cancer. It’s a sponsored walk for people of all ages and abilities. Every year almost 3,700 people are diagnosed with bowel cancer in Scotland and over 1,600 people die from the disease. However that shouldn’t be the case. It’s treatable and curable, especially if diagnosed early. Sign up to the walk in Edinburgh on Saturday, September 1, or to receive a fundraising pack with everything you need to hold your own memorable walk, visit: bowelcanceruk.org.uk/walktogether. If you need inspiration on walks in your area, visit The Outdoor Guide: theoutdoorguide.co.uk.